Upper airway hematoma (UAH) is a rare but life-threatening complication of oral anticoagulants requiring early recognition. However, no consensus exists regarding the best approach to treatment. We therefore, sought to systematically review the published literature on UAH to elaborate its demographic and clinical characteristics, treatment, complications, and outcomes. 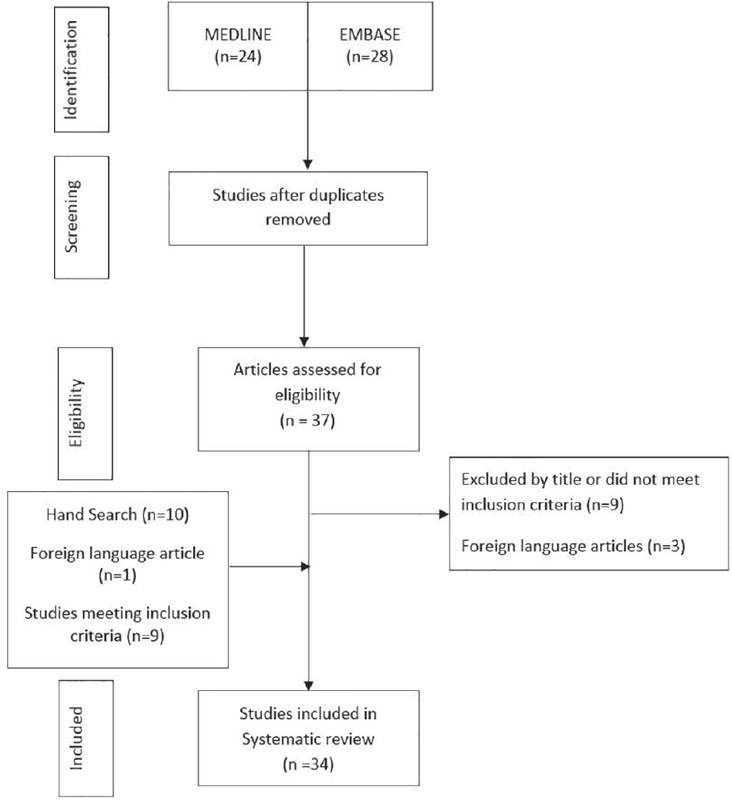 A systematic electronic search of PubMed and EMBASE for case reports, case series, and related articles of UAH related to warfarin published from inception (November 1950) to March 2015 was carried out. Categorical variables were expressed as percentage and continuous variables as mean ± standard deviation (SD). Statistical analysis was done using Statistical Package for the Social Sciences (SPSS) version 20.0.All cases were reported to have UAH as a complication of anticoagulation therapy with warfarin. Demographic and clinical characteristics, treatment, complications and outcomes of UAH were studied. Thirty-eight cases of UAH were identified from 34 reports in the literature. No gender preponderance (male = 52.78%) was seen and the average age of presentation was 60.11 ± 12.50 years. 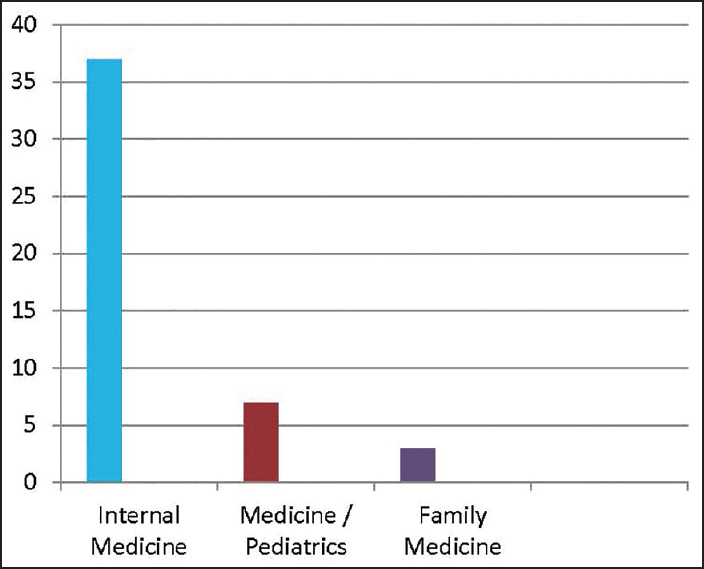 Dysphagia, sore throat, and neck swelling were the most common symptoms and the mean international normalized ratio (INR)at presentation was 8.07 ± 4.04. Most cases had sublingual hematoma (66.57%) followed by retropharyngeal hematoma (27.03%). Of the cases, 48.65% were managed conservatively while the rest underwent either cricothyrotomy or intubation with the time to resolution being 7.69 ± 5.44 days. UAH is a rare butpotentially serious complication of warfarin therapy. It is more common in the elderly population with supratherapeutic INR; inciting events were present in many cases. Overall, it has a good prognosis with significant morbidity present only if concomitant respiratory compromise is present. Reversal of anticoagulation with low threshold for artificial airway placement in the event of airway compromise leads to a favorable outcome in most cases. Background: Despite the widespread use of thymectomy in myasthenia gravis (MG) patients, it has remained controversial as to whether this procedure is of a similar efficacy and clinical outcome among MG patients with thymoma and thymic hyperplasia. Aim: We sought to determine the long-term clinical outcomes of MG patients who received extended transsternal thymectomy associated with pyridostigmine and prednisolone postoperatively. Materials and Methods: In a retrospective study from January 1999 to December 2013, MG patients who underwent thymectomy were followed up. Out of 41 MG patients admitted in our center, 25 patients had undergone thymectomy adjunctive to pyridostigmine and prednisolone therapy postoperatively. The primary endpoints included improvement in individual diplopia, ptosis, dysphagia, dysarthria, dyspnea, and limb weakness. In addition, according to the MG Foundation of America (MGFA) criteria, response to therapy was defined as complete stable remission (CSR), pharmacologic remission (PR), and minimal manifestation (MM) as secondary endpoints. Results: Majority of the patients were male (60%) and the mean age of the patients was 32.2 ± 13.9 years. 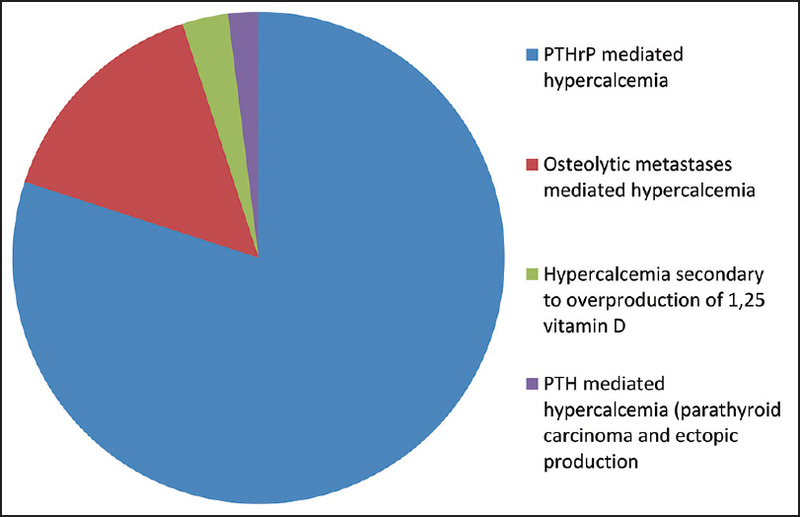 Fifteen (60%) and 10 patients (40%) had thymoma and thymic hyperplasia, respectively. All the patients were followed up during a mean period of of 86.9 ± 50.3 months (minimum 10 months and maximum 168 months). 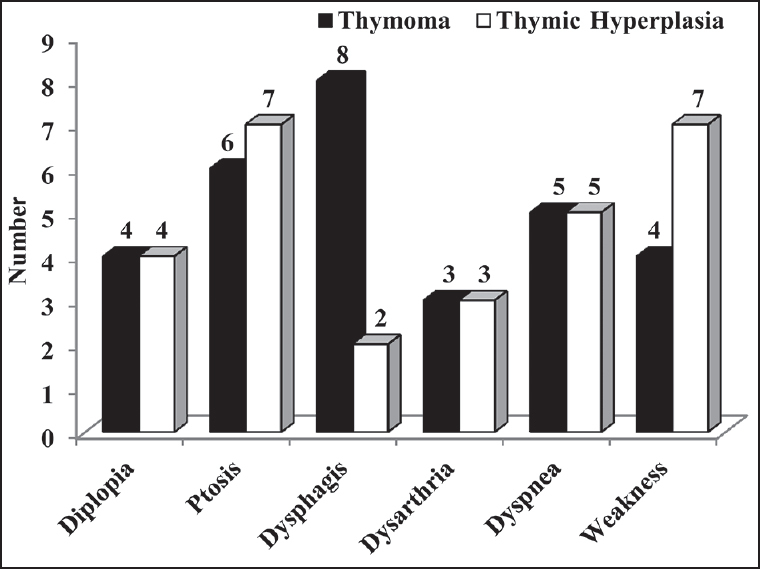 The rates of CSR, PR, and MM were comparable between the thymoma and thymic hyperplasia groups (P = 0.584). Based on the Kaplan Meier analysis, the probabilities of CSR, PR, and MM were not significantly different between patients with thymoma and thymic hyperplasia. Conclusion: The extended transsternal thymectomy, along with the postoperative regimen of pyridostigmine and prednisolone was associated with a high rate of clinical improvement among MG patients with thymoma or thymic hyperplasia. Background: Prader-Willi syndrome (PWS) results from a deletion of the paternal genes in the region of chromosome 15q11-q13. PWS develops hyperphagia, which when left unmanaged, leads to an excessive ingestion of food. 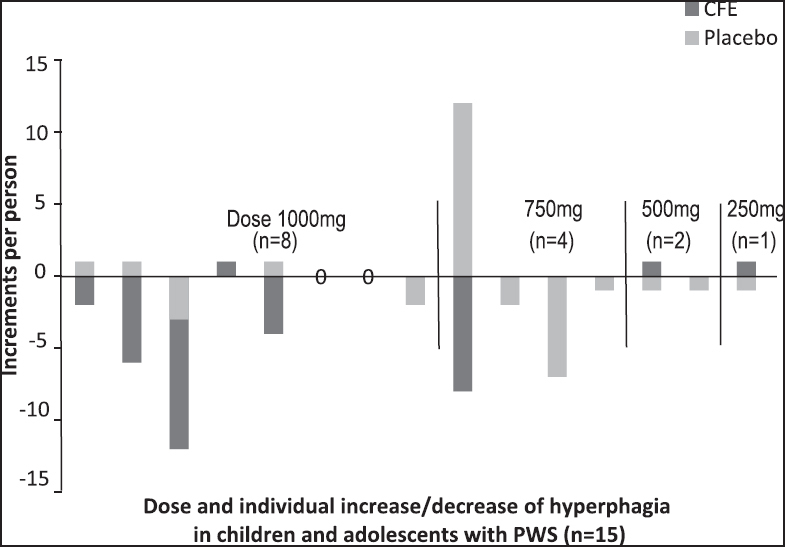 To date there is inadequate pharmacological treatment or supplementation for modification of the PWS hyperphagia and/or the associated behaviors. Therefore, the best practice is familial supervision and restriction of diet and environment. Aim: We aimed to determine if the natural supplement of Caralluma fimbriata extract (CFE) could attenuate hyperphagia or the associated appetite behaviors in children and adolescents with PWS over the 4-week pilot trial period. Materials and Methods: We conducted a placebo-controlled, double-blind, randomized crossover trial over a 10-week period to investigate the effects of CFE on hunger control, in a cohort of children and adolescents with confirmed PWS (n =15, mean age 9.27 ± 3.16 years, body weight 43.98 ± 23.99 kg). Participants from Australia and New Zealand ingested CFE or a placebo of maltodextrin/cabbage leaf over a 4-week period, with a 2-week washout before the crossover to the other treatment. Weekly comparisons in appetite behavior, severity, and drive were recorded by parents, as scaled time-point measures on a hyperphagia questionnaire validated for PWS. Results: CFE administration was found to induce a significant accumulative easing of hyperphagia (P = 0.05), with decreases evident in one-third of the participants. Furthermore due to CFE supplementation, a significant decrease (P ≤ 0.05) was recorded in the category of behavior and a decrease in hyperphagia (n = 8, P = 0.009) was observed at the highest dose 1,000 mg/day (recommended adult dose). There were no reported adverse effects at any dose. Conclusion: We demonstrate that an extract of the Indian cactus succulent Caralluma fimbriata eases hyperphagic appetite behavior within a cohort of children and adolescents (n = 15) with PWS without notable adverse effects. The outcomes of this study will have a potential positive impact on PWS management. Background: Balneotherapy (BT) is a treatment modality that uses the physical and chemical effects of water, including thermomineral, acratothermal, and acratopegal waters. It has many effects on cardiovascular system. Aim: The aim of the study is to investigate the effects of 3-week BT on blood pressure of osteoarthritis (OA) patients with no hypertension (HT), and controlled or uncontrolled HT. Materials and Methods: The OA patients (n = 270) were divided into three groups: No HT, controlled HT, and uncontrolled HT. All the groups received BT in the facilities of our university hospital at the same time every day (10:00-11:30 AM) for 10 min per day, 5 days per week, for a total duration of 15 days in a 3-week period. Systolic and diastolic blood pressures and pulse rates were measured before and after BT on daily basis. Results: Overall, (1) the pulse rates of study groups measured after BT were significantly increased compared to before BT; (2) the systolic blood pressures of study groups measured before and after BT were found as comparable; and (3) the diastolic blood pressures of no HT and controlled HT groups measured before and after BT were not statistically significant (P > 0.05); however, in the uncontrolled HT group, the diastolic blood pressure showed a decreasing trend after BT (P < 0.05). Conclusions: In patients with OA, BT can be safely used without resulting in any meaningful changes in systolic and diastolic blood pressures in patients with normal and controlled HT but a decrease in diastolic blood pressure of patients with uncontrolled HT. This may be an advantage in OA patients having HT as comorbid disease. Background: Chronic kidney disease is an increasingly prevalent health problem with the potential for poor outcome of end-stage renal disease. Hospitalized critically ill patients are prone to acute renal injury from numerous factors such as poor renal perfusion secondary to ischemia and hypotension, nephrotoxin exposure, and intravenous contrast exposure. Aims: We set to explore resident awareness and knowledge about chronic kidney disease management, timely nephrology referrals, preventing inadvertent acute kidney injury (AKI), and the understanding of basic electrolyte physiology. 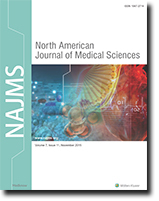 Materials and Methods: We conducted a cross-sectional study using an online questionnaire survey of internal medicine, Medicine/Pediatrics and Family Medicine residents in the United States to determine the knowledge of residents during their training about nephrology. Results: The survey questionnaire was sent out to 270 residents. Forty-seven (17%) respondents completed the survey. Out of them, 57% of the residents chose to refer a patient with an estimated glomerular filtration rate <30 mL/min/1.73 m 2 to a nephrologist; 66% felt that it was safe to use aspirin in stage IV chronic kidney disease; 82% did not want to use metformin or Lovenox in stage IV chronic kidney disease; 87% answered that they would make the patient resume angiotensin converting enzyme inhibitor or angiotensin II receptor blockers (ARBs) about 48-72 h after contrast exposure. Only 7.5% decided to hold angiotensin converting enzyme inhibitors/ARBs before contrast exposure. Meanwhile, 70% correctly identified the efferent arteriole as the site of action of angiotensin converting enzyme inhibitors/ARBs and 76% identified nitrofurantoin as a contraindication in renal insufficiency. Conclusion: Residency offers a golden opportunity for resident physicians to create a strong foundation of concepts in medicine. There are several basic areas in the field of nephrology that need to be further emphasized during residency training to help improve patient care and potentially decrease the incidence of AKI. Context: Groove pancreatitis is a rare form of chronic pancreatitis affecting the "groove" of the pancreas among the pancreatic head, duodenum, and common bile duct. The exact cause is unknown, although there are associations with long-term alcohol abuse, smoking, peptic ulcer disease, heterotopic pancreas, gastric resection, biliary disease, and anatomical or functional obstruction of the minor papilla. The diagnosis can be challenging. Endoscopic ultrasound (EUS) and magnetic resonance cholangiopancreatography are the preferred imaging modalities. The treatment of choice is conservative although surgical intervention can sometimes be required. Case Report: A 57-year-old male with a history of human immunodeficiency virus and hepatitis B presented with 4 days of epigastric pain. Abdominal exam revealed absent bowel sounds and epigastric tenderness. He had a creatinine of 1.72 mg/dL, potassium of 2.9 mmol/L, and a normal lipase level of 86 U/L. Liver enzymes and total bilirubin were normal. 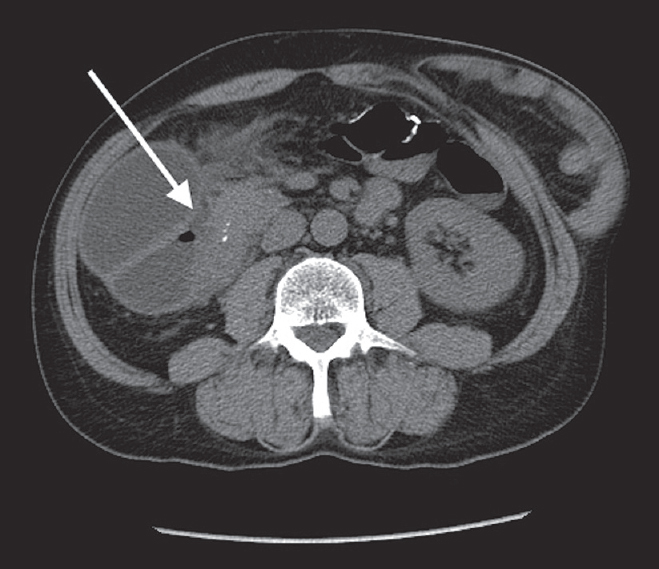 Computed tomography abdomen showed high-grade obstruction of the second portion of the duodenum without any obvious mass. An esophagogastroduodenoscopy showed a mass at the duodenal bulb causing luminal narrowing, with biopsies negative for malignancy. Magnetic resonance imaging revealed a mass in the region of the pancreatic head and descending duodenum. EUS revealed a 3 cm mass in the region of pancreatic head with irregular borders and no vascular invasion. Fine needle aspiration (FNA) was nondiagnostic. The patient then underwent a Whipple's procedure. Pathology of these specimens was negative for malignancy but was consistent with para-duodenal or groove pancreatitis. Conclusion: The low incidence of groove pancreatitis is partly due to lack of familiarity with the disease. Groove pancreatitis should be considered in the differential for patients presenting with pancreatic head lesions and no cholestatic jaundice, especially when a duodenal obstruction is present, and neither duodenal biopsies nor pancreatic head FNA confirm adenocarcinoma. Context: Tracheo-bronchial aspiration is the most invalidating condition which can happen to patients affected by dysphagia, especially when caused by central neurologic disorders; the associated pneumonia episodes represent the most frequent cause of death in these patients. 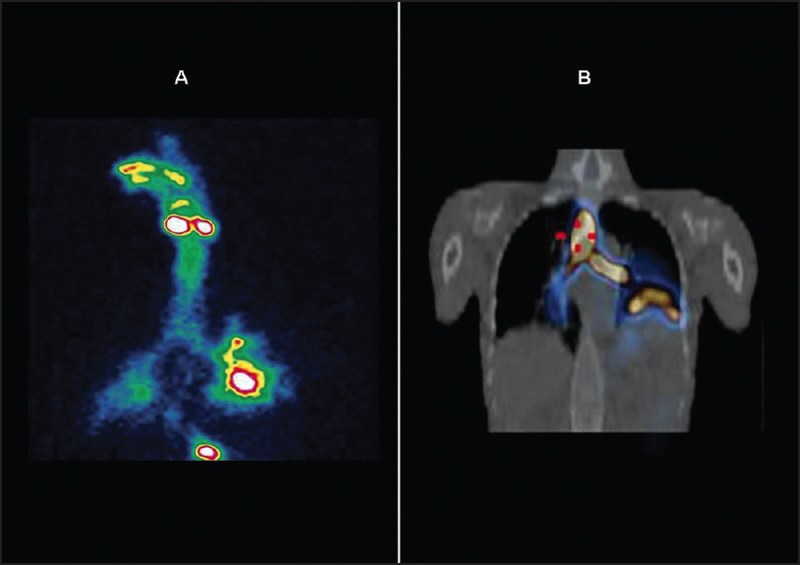 Oro-pharyngo-esophageal scintigraphy (OPES) allows both functional imaging and semiquantitative evaluation of the subsequent phases of swallowing. Case Report: We evaluated by means of OPES a woman who had previously undergone high-dose external beam radiation therapy for a nasopharyngeal carcinoma, which determined tissue fibrosis and progressive dysphagia. Conclusion: In this patient with dysphagia, OPES was a simple, inexpensive, noninvasive, and reliable technique that allowed to show the presence of bolus aspiration and quantified tracheobronchial aspirate.